The technique was used on several older Formula One cars, such as the McLaren Mercedes MP4-19B with which Kimi Raikkonen won the 2004 Belgian Grand Prix. 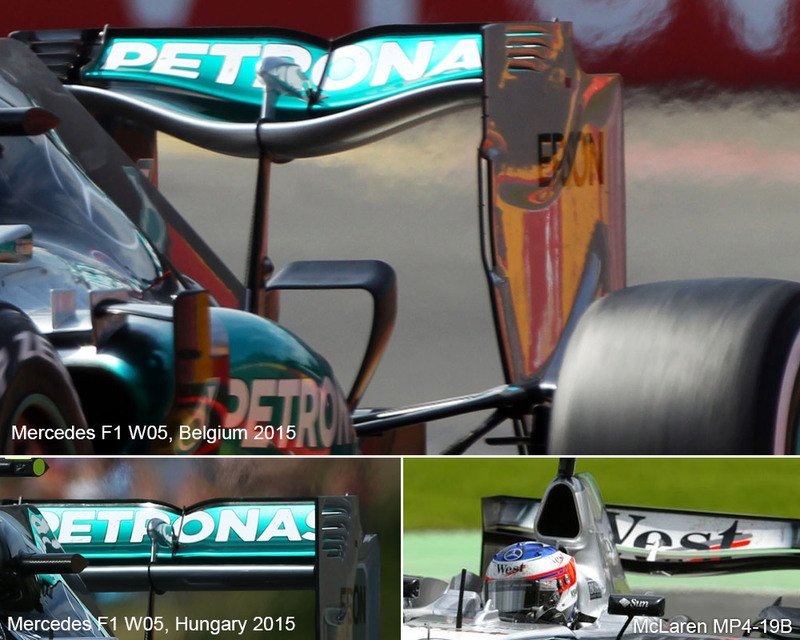 Interestingly however, since the introduction of the DRS system, no team has ventured out on track with a curvy wing like on the Mercedes F1 W06, most likely because of the complexity that comes with creating such a wing. It's well known that in recent years, teams have updated their rear wings with an eye on maximising the DRS effect, thus allowing the wing to cut as much drag as possible while the DRS (the upper rear wing flap) is open. This is all reasonably well understood for invariable wing profiles along the span, but becomes difficult with curved edges. The whole purpose of the curvy wing is, just like it has always been, to create an optimal solution for a given track. A curvy wing like this should help cut drag, as it focuses on creating downforce in the middle, while on the outer extremities reduces the strength of the vortex that originates from the top of the rear wing endplates (due to the pressure difference between airflow in the inner and outer sides of the end plates). 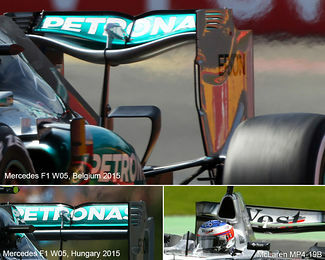 Please also note that Mercedes have opted to assist the wing's efficiency in its central part by adding a single-element monkey seat, further making it clear that this change is a way to search for the right balance between downforce and drag, rather than simply reducing drag to attain higher top speeds (as other teams have done to keep up with Mercedes on the straights). It is unclear at the moment if this wing will be seen again (since it likely generates more downforce that Mercedes wants for Monza), but one can expect that, if not this year, many other teams will have a go at a similar design for 2016.